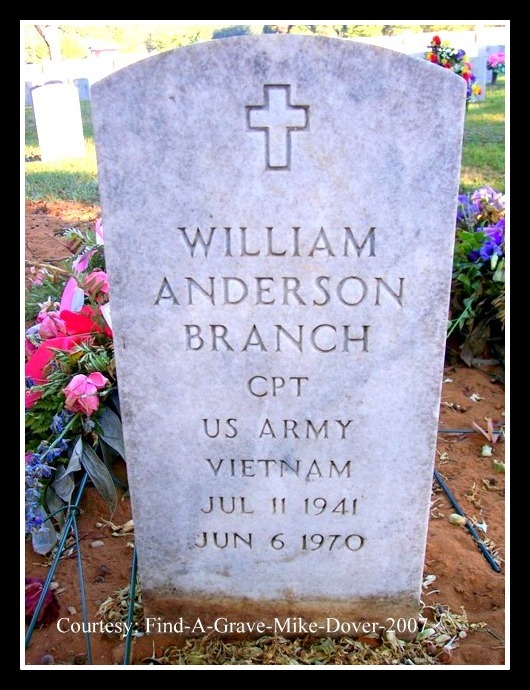 Captain William Anderson Branch, 28, of 15 Overlook Avenue, Belleville, N.J., was killed in action on June 6, 1970, when the helicopter in which he was a passenger crashed on landing due to hostile enemy action in Binh Duong, South Vietnam. Capt. Branch was a two-tour infantry soldier in the 2/14th Division, 25th Infantry. His second tour of duty began July 24, 1969. He spoke fluent Vietnamese, gathered good intelligence, and he drew detailed maps that, according to his colonel, helped make a severe dent in enemy forces of that time. Capt. 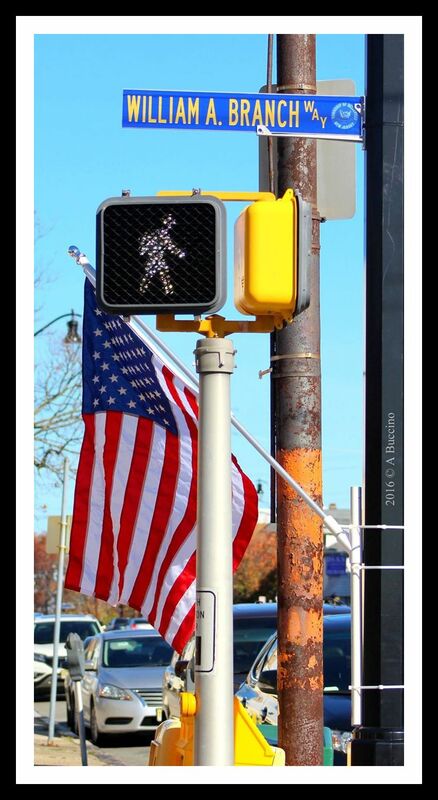 Branch was awarded a Silver Star, Bronze Star and two Purple Hearts during his time in Vietnam for service, gallantry in action and wounds sustained in battle. William Branch was born in Ben Hill County, Ga., on July 11, 1941. He is the son of Margaret G. and William 'Rusty' Branch of Belleville. Capt. Branch was survived by his wife Judith, and his two-year-old daughter Jennifer. Capt. Branch is buried at Fort Benning Post Cemetery, Fort Benning, Ga. The President of the United States of America, authorized by Act of Congress July 9, 1918 (amended by an act of July 25, 1963), takes pride in presenting the Silver Star (Posthumously) to Captain (Infantry) William Anderson Branch, United States Army, for gallantry in action. Captain Branch distinguished himself by heroic actions on 16 September 1969, while serving as Commanding Officer of Company A, 2d Battalion, 14th Infantry Regiment, 25th Infantry Division, in the Republic of Vietnam. While on a combat operation, the combined units of Company A and a South Vietnamese company discovered a large enemy bunker complex. As the units searched the numerous emplacements they came under heavy fire from a large hostile force. Captain Branch immediately deployed his men and began directing their fire on the insurgents. Spotting two of his men who had become trapped in the enemy kill zone by the intense fire, Captain Branch, with complete disregard for his own safety, fearlessly exposed himself to the deadly barrage of fire directed at him as he rushed forward to the beleaguered men and led them clear of the embattled area. In full view of enemy gunners, Captain Branch moved from position to position as he organized the combined units and led them in a successful assault against the entrenched enemy force, driving them from the area. His valorous actions contributed immeasurably to the success of the mission and the defeat of the hostile force. Captain Branch's bravery, aggressiveness, and devotion to duty are in keeping with the highest traditions of the military service and reflect great credit upon himself, the 25th Infantry Division, and the United States Army. Two men from Headquarters Company, 2/14 Infantry, were killed when OH-6A tail number 68-17366 was shot down 10 kilometers southeast of the Dau Tieng base camp - Captain William A. Branch and Captain William L. Byrd of Rossville, Georgia. Captain Branch was on his second tour of duty in Vietnam. His first was in 1966-1967 when he served as a Military Assistance Command, Vietnam - MACV Advisor with the 2nd Battalion, 46th Army Republic Vietnam - ARVN Infantry in Long An Province. William Anderson Branch attended North Georgia Military College from 1960 to 1964. North Georgia College is 'The Military College of Georgia,' a senior military college. Neither as large nor as well known as some of the senior military colleges, The Military College of Georgia has provided commissioned officers to the armed forces since the 1870s. The 27 members of North Georgia's Corps of Cadets who died in Vietnam are remembered by a memorial stone on the campus. Captain Branch is the third name engraved on the memorial. Similar stones remember the men who died in the World Wars, Korea, and more recently in the Middle East.